Superior Quality, High performing Diamond tools. Carbon Diamond Abrasives has a vision to create the best Diamond tools on the market. That vision means that we are committed to producing diamond core drill bits that are innovative, and built with the highest quality materials and manufacturing techniques available in the industry. tools that are shaking up the industry. What this means for you is core drilling equipment that is high performing and built to withstand your toughest jobs. So if you’re ready to experience the future of Diamond saw blades, visit our online store or contact us today. With Carbon, there’s no need to download a catalogue or search endlessly on Google. Our online store contains all the diamond tools, machinery & associated products you need to get the job done. Created with industry professionals in mind (and with plenty of feedback from them as well), it’s easy to shop. Simple to pay. And quick to ship. This means you getting the tools you need when you need them. Our team also knows how hard it can be to get ahold of the tools you need for your job. Getting in touch with your local rep, downloading catalogues, or finding time to drop by your local shop equals a lot of wasted time. We wanted to make getting our drilling supplies as simple as possible, by launching a fully integrated online store. Whether it’s for coring and sawing reinforced concrete or other mineral resources, our online store contains all the concrete cutting blades, equipment and accessories you need for the job. It’s easy to shop. Simple to pay. And quick to ship. Getting you the cutting blades supplies you need, when you need them. So why our Concrete cutting blades? We know that there are a lot of other companies producing core bits, but we’re confident that ours are the best in the market. All our tools are produced with the most advanced manufacturing processes available and use the highest-grade synthetic diamonds and metal bonding powders available in the industry. Producing a diamond blades that are built to last through the toughest jobs and give you a longer lasting product. When it comes to the production of our diamond tools, we make sure that they are as easy to use, but as technologically advanced as possible. All of our blades and core bits are imbedded with our multilayered dry diamond dispersion technology, that creates blades that have a continuous rim and cut precise. We have created diamond saw blades that have a truly unique segmented design, and that you won’t find with other companies. This innovative design means that your tools will withstand the most extreme conditions. 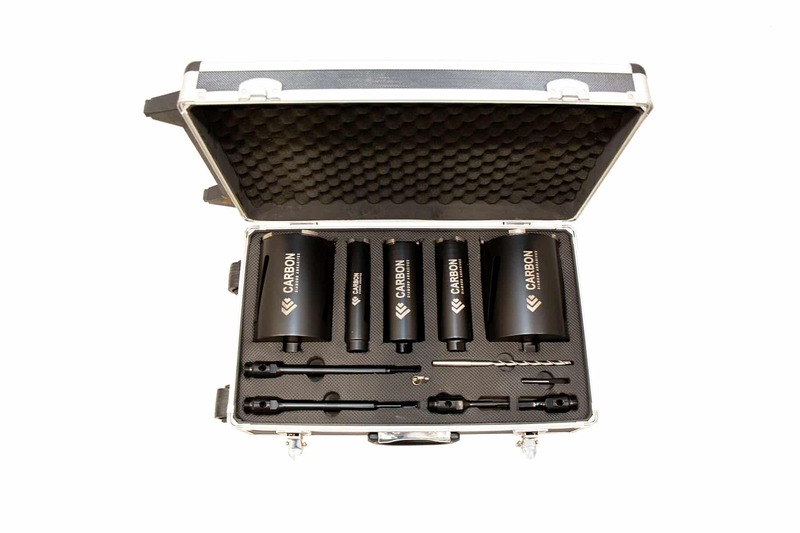 At Carbon, we understand the difficulty that can come with finding high quality core bits that will last. Which is why when we started producing diamond tools, our team went all in on design, quality, and R&D. Everyone single diamond tool we’ve manufactured has been constructed with the most up to date technologies available in the diamond tool industries, and with feedback from fellow industry professionals. This formula has provided us with diamond products that are truly the best out there. We’ve spent hundreds of hours on R&D over 10+ years. Everything from our diamond saw blades to our core bit drill sets have gone through extensive quality control test both in our factories and in the field, to ensure that they are built to take on the toughest jobs. When customers contact Carbon, it will be the owners who answer the phone. We take all questions and feedback seriously and use this information to assist in future product innovation.